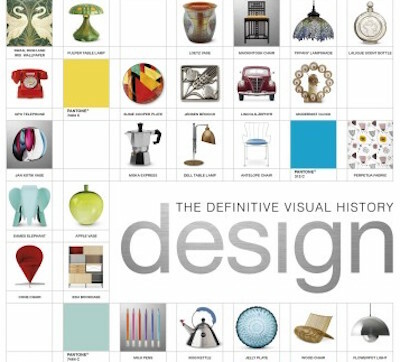 Design: The Definitive Visual History claims to be "the most comprehensive, inspiring, and accessible history of design ever." It features industrial design, ceramics, glass, furniture, jewellery, metalwork, textiles, and graphics, so it's comprehensive in that sense, though its coverage is broad rather than deep. Accessible often means simplified, which is the case with this and other DK books: the captions are largely descriptive, and the body text is limited to one or two paragraphs per page. The book (written by Alexandra Black, RG Grant, Ann Kay, Philip Wilkinson, Iain Zaczek) is probably unrivalled for the quantity of its photographs: there are thousands of them, all in colour, though most are quite small. Its format is similar to Decorative Arts and the more concise The Look Of The Century (by Michael Tambini). Phaidon Design Classics has larger photographs, and profiles 999 objects. Design covers the history of its subject from 1850 until today, and it's surprisingly up-to-date, including products from 2015. Each double-page spread covers a different aspect of design, and the most interesting are those that show the evolution of various product categories, including writing machines (from typewriters to computers) and telephones (from rotary dials to smartphones). It has no bibliography, though History Of Modern Design (by David Raizman), The Story Of Design, and the superb History Of Design are the most comprehensive narrative histories of design.